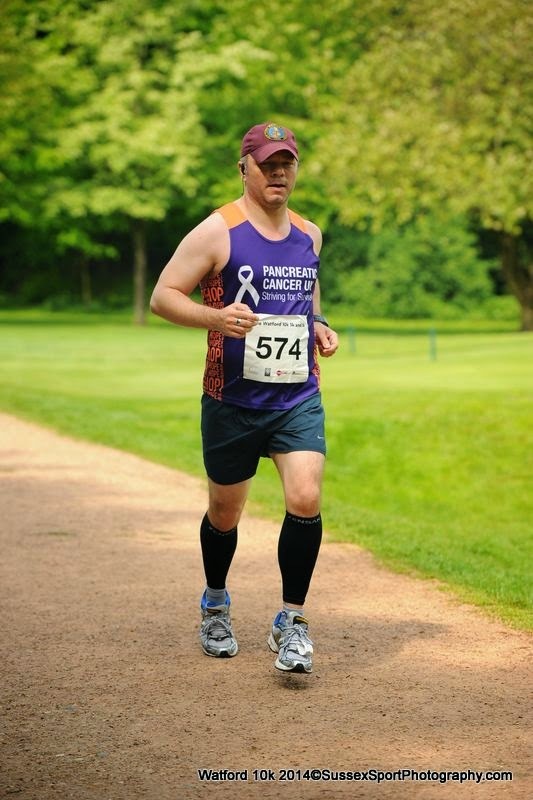 This weekend saw my fourth race for Pancreatic Cancer Uk, and the first of 5 in 26 days in May, and 40th since taking up running May 2012. 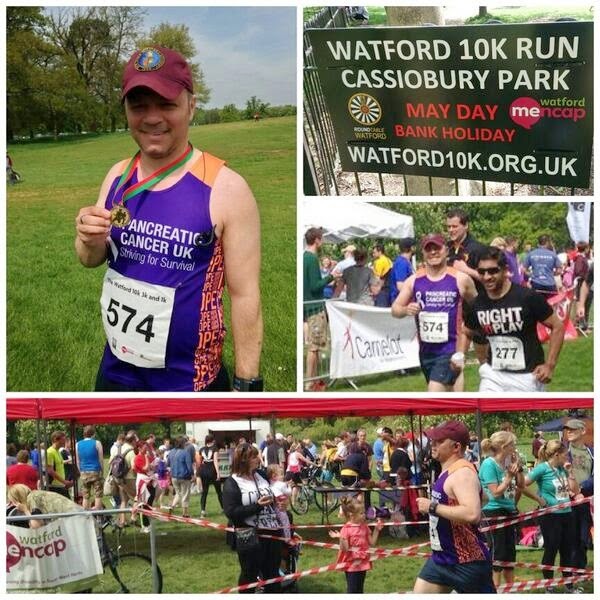 It was the Watford 10K, and took me to Watford in NW London for the first time in my life. Despite tube strikes recently I took the met line and was glad I did, especially given that a signal failure between Euston and Watford caused severe delays on the overland. It was to be my first trail run. I know that I did have to run through the woods at the Richmond Deer Park half marathon earlier in the year, but that was mostly on path. The Watford 10K started on grass, ended on grass, and had mud, horse manure, roots, hills and wooded trails from beginning to end. I was trying out a pair of New Balance 1080 V2 that was hopefully going to repair my faith in shoe makers after: Mizuno Wave Riders pinched by Hobbit feet at the heel, Saucony pinched at the midfoot, Nike changed my foot motion so much I ended up with second metatarsal overload syndrome, and Brooks, well, Brooks are my go to shoe. My Pancreatic Cancer UK cheerleading time would be present at a race. Although I am disappointed by the lack of a tent at the BUPA London 10K, I will be glad of the purple throng on the route. This was another Nice Work organised race. They are a bit of a bipolar organiser for me as 1. The races are well organised, marshalled, very often and in London. However, 1. the bling is bargain bucket for the £25 race fee, no goodie bag, not enough bananas sometimes, water in cups not water. After the Regents Park race last year, and for Easter, I did say I would not race any more Nice Work races but the truth of the matter is that I cannot comfortable race locally without relying on them. 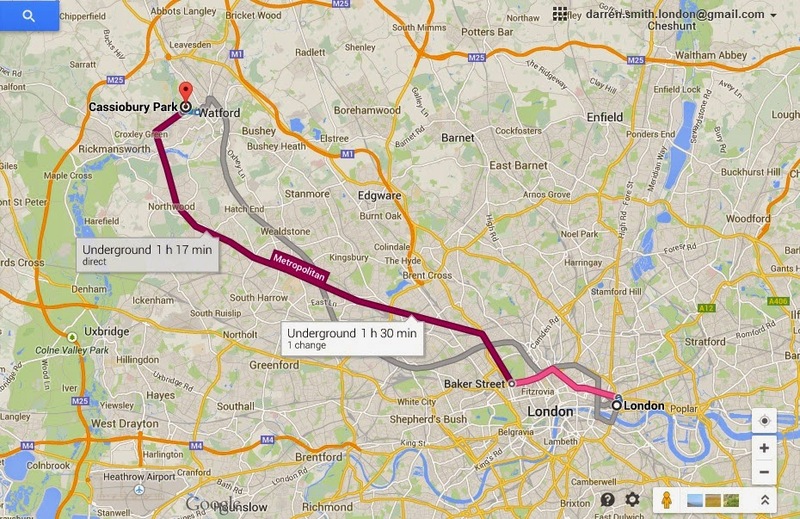 As I do not drive I need to rely on London races, or races where I can get to via the train. Nice Work and MCC run a lot of races around the parks of London. You pay £25 for that, there is timing, there is water and there are marshals, but nothing bespoke in the medal front. Where non-London races seem to all get something special to take home. The race route started at Cassiobury Park right by the Metropolitan line station in Watford. It was a lovely sunny day and it was obvious this was a much bigger Nice Work event that the Regent’s Park standard fare. Maybe it was due to the numbers, nearly 2000 apparently, but there was a row of portaloos, engravers, and stalls. This was new. The time changed in the week, but Martin, the organiser sent out an email will plenty of time to announce this. I was dehydrated, I hadn’t slept well, the new shoes pinched a little, but hey ho. It was a run. I do not like running on grass, the uneven surface always worries me. The idea of turning your ankle over does not appeal to me. The consequences of that can be season ending. But again, hey ho! It was a run. I started at my usual ¾ of the way back, sporting my Pancreatic Cancer UK vest, new New Balance shoes, and extra songs on my play list. Oh yes, it was time to add a few old classics to the Shuffle. How old school is that? The race was on grass, and seemed fast to start. Although that could have been the shoes changing my gait. After a quick once around the supporters in the start/finish area we drew a diagonal across the park and into the woods. And here the fun began. It was quite muddy still from rains the previous day. It was very hilly in places and with loose stones, horse deposits, and roots going both up and down. Walking was almost essential in places, as the sun made its way through the canopy and the humidity was baking. The trails were pretty narrow too, especially in places, and the elite runners had to barge their way through as they raced toward the end of their second lap of the woods, as we continued plodding around the first. I walk-ran-walked as per, and the new songs did help. 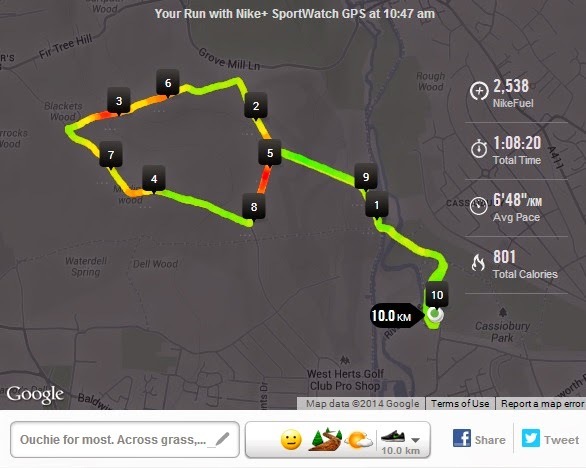 I kept a lot in reserve, with one eye on the next run at Regent’s Park Summer 10K in 5 days. Indeed, the races are no longerSunday to Sunday, with a week to rest. Watford was Monday, Regent’s Park the following Saturday. 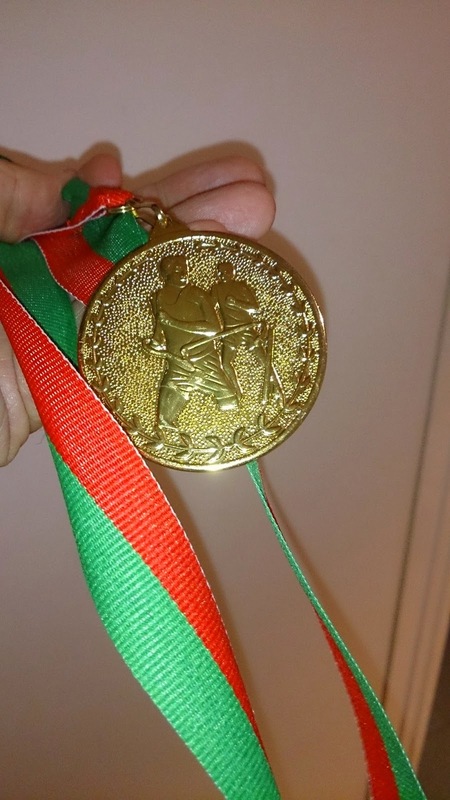 At the end of the month I am actually glad that the BUPA London 10K, that was supposed to be on Monday 26th was moved to the Sunday 25th as I have the Luxembourg night marathon/half on the following Saturday. So I was not breaking any records here. Again bargain bucket bling etched with just the race name and not even the date. But this is what you get from Nice Work. I will not race any more of their races after Saturday. Note the powering for the line bottom photo. I certainly had plenty in reserve.